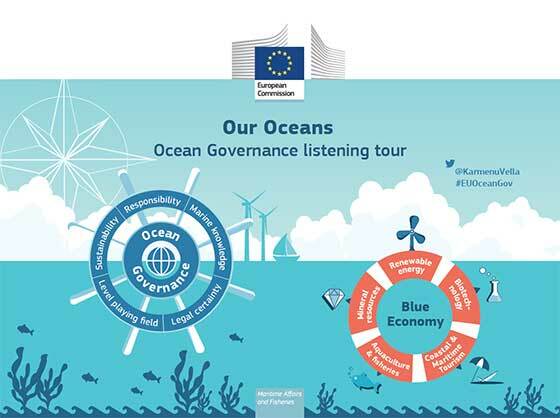 The European Commission launched today a public consultation, to collect views on how the EU could contribute to achieving better international governance of oceans and seas to the benefit of sustainable blue growth. Commissioner Karmenu Vella, responsible for Environment, Maritime Affairs and Fisheries, launched the consultation at the World Ocean Summit in Portugal: "If our oceans are not healthy, our economy falls ill. Global maritime challenges require global solutions. I am committed to work intensively to define Europe's role in international ocean governance, for a sustainable blue economy and blue growth." The international discussion on ocean governance is growing as the use of marine resources is increasing globally. Illegal fishing, uncontrolled seabed mining, marine litter are only some of the challenges that need to be addressed through global cooperation. The existing international ocean governance framework could be ineffective in addressing such maritime challenges; particularly in the 60 per cent of the oceans that are beyond national jurisdictions. The EU plays a prominent role in this discussion. The blue economy already produces 5% of its GDP and provides nearly 5 million jobs. Moreover, the EU is a global frontrunner in the development of sustainable ocean based economies through its robust set of environmental rules, integrated maritime policy, reformed Common Fisheries Policy and its global fight against illegal fishing. In order to assess the best path for action and the EU's role in this, the Commission is reaching out to all stakeholders - international organisations, state actors, NGOs, business, the research community, academia and civil society - via an online public consultation. The consultation will be complemented by a "listening tour" during which Commissioner Vella will personally engage with stakeholders and international partners to gather their views and discuss possible ways forward. The public consultation will run until 15th September 2015.